Catherine Carlson, who generously gave of her time and family fortune to support RIT and many institutions in Greater Rochester, died Thursday. 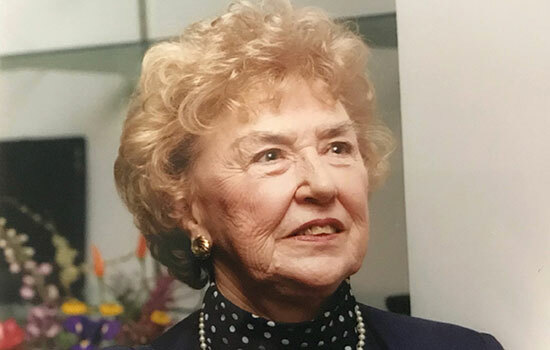 Ms. Carlson, whose father Chester Carlson invented the technology that launched Xerox Corp., was 91 and served the university as an honorary trustee. RIT’s Chester F. Carlson Center for Imaging Science, a 70,000-square-foot facility with 20 laboratories, five classrooms, 40 offices and a 150-seat auditorium dedicated in 1989, benefitted from her family's philanthropy, as did the College of Science. RIT President David Munson said the Carlson legacy will long be remembered. “Not only did Chester Carlson’s xerography invention change the world, the Carlsons – Chester, Dorris and Catherine – continued to quietly change the world through financial support for education, health care, civil rights, public television and so much more,” Munson said. Originally from Milton, Mass., Ms. Carlson graduated from Boston University with a degree in philosophy. She studied medicine and business, and moved to Rochester in 1969 to work with Chester Carlson. She was adopted as an adult by Chester and his wife, Dorris. Chester Carlson, who avoided the spotlight and wanted to give away his fortune to better the community, his wife and Ms. Carlson cumulatively gave away hundreds of millions of dollars throughout the years, Ms. Carlson had said. Retired RIT President Albert Simone, who also grew up in Massachusetts, immediately connected with Ms. Carlson. She traveled with Simone to RIT Croatia in Dubrovnik to help launch RIT’s first overseas campus in 1997, and also accompanied Simone on a visit to the local Congressional delegation in Washington, D.C. He said Ms. Carlson gladly helped RIT start its first Ph.D. program, in imaging science. “It was just an extension of the imaging Chester was doing, looking at the heavens, stars, planets, and looking at the tiniest things in medical imaging,” he said. Also on the trip to Croatia was RIT trustee Ann Mulligan, RIT Provost Emeritus and former Vice President for Academic Affairs Stan McKenzie, and Simone’s wife Carolie, who combined the trip to Croatia with some tourism in Turkey and Greece. Ms. Carlson enjoyed traveling the world and attending theater and performing arts. Her love of art was evident when she served as a co-chair with Mulligan in the fundraising effort to bring a large Albert Paley sculpture, known as “The Sentinel,” to RIT in 2003. She also was personally interested in the community. To better understand the duties of police officers, Ms. Carlson attended – and graduated – from a 12-week citizens police academy offered by the Rochester Police Department. And for many years, Ms. Carlson bought dictionaries for every student in the Rochester City School District - in many cases, they were the first books the students had ever owned. Details about services were not immediately available. The RIT flag will be lowered in her memory at a future date to be determined.